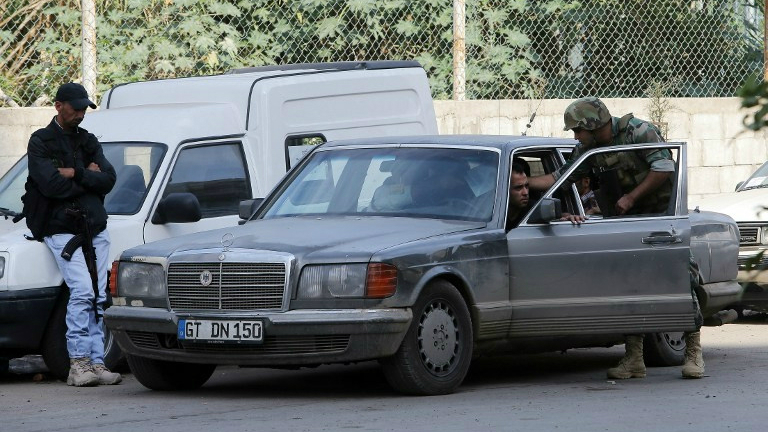 TRIPOLI, Lebanon (AFP) — Lebanese soldiers were deployed Monday without incident in a Tripoli district where thousands of civilians fled deadly clashes between Islamist militants and the army in the country’s second city. The fighting was the fiercest bout of Syria-related violence in the northern port city since the 2011 outbreak of the civil war in neighboring Syria, leaving 11 soldiers and five civilians dead between Friday and Sunday. 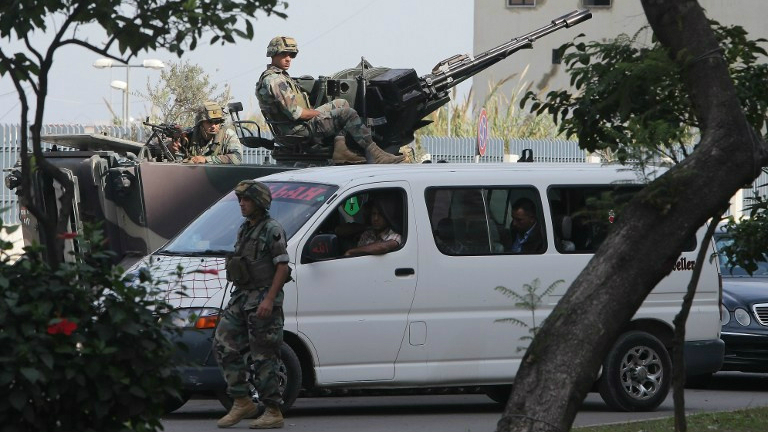 It was also the first to pit Islamists against the army in Tripoli. An AFP correspondent saw major damage to the impoverished Sunni district of Bab al-Tabbaneh, which Islamists accused of ties to al-Qaeda had used as their stronghold. On Monday morning, the army was in full control of the Islamist bastion as troops moved in without facing any resistance, a military spokesman told AFP. 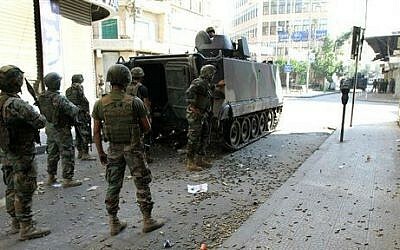 “The army has taken over Bab al-Tabbaneh,” said the spokesman, adding that troops had captured 162 militants since Friday. The army, taking full control of Bab al-Tabbaneh for the first time, issued a statement urging militants still at large to turn themselves in. An AFP correspondent, who was briefly allowed to accompany troops into the district, said no militants were sighted and that the streets were largely deserted. A 72-year-old resident of Bab al-Tabbaneh told AFP she had never before been forced to flee her neighborhood, “not even during the civil war” that raged in Lebanon from 1975 to 1990. “But this time, I had to flee my house, along with my five grandchildren. I am in charge of them, because their father is in jail,” said Umm Mohammed Jaaburi, wearing a blue nightgown and white headscarf. “The violence was unprecedented,” she said. Thousands of civilians poured out of the neighborhood, which is home to some 100,000 residents, during a lull in fighting late on Sunday. “I saw armed men move through the houses and on the rooftops, shooting at the army, which fired back using mortars,” said Jaaburi. “A building in front of ours was filled with flames, and the smoke reached our house,” she said. Burnt-out vehicles littered the edges of Bab al-Tabbaneh, and several homes and shops had suffered extensive fire damage. 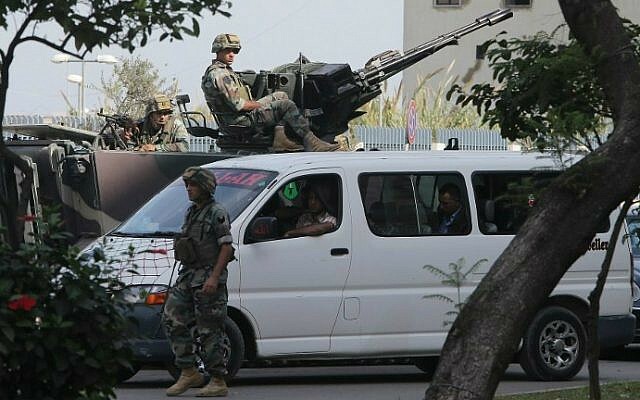 The fighting in Bab al-Tabbaneh followed unprecedented, deadly violence which hit the historic heart of Tripoli on Friday. 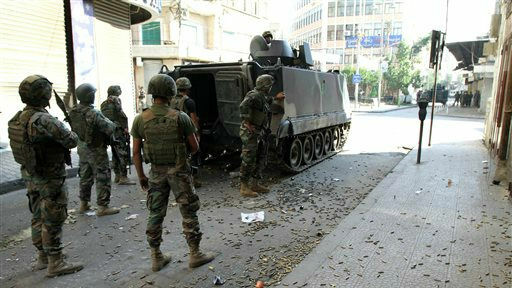 At the weekend, the army had pushed the gunmen back to their stronghold in Bab al-Tabbaneh. Amid chaotic scenes on Sunday night, people of all ages fled their battered neighborhood. Many of the women walked out in their pajamas, crying as they and the men were searched by army and intelligence troops. Schools and universities were closed across Tripoli on Monday because of the violence. The coastal city has seen repeated clashes between Sunni militants sympathetic to rebel fighters in neighboring Syria and Alawites loyal to the Damascus regime. The army has also come under growing attack by Sunnis who accuse it of colluding with Shiite militant group Hezbollah in its intervention in the Syrian conflict on the side of the regime. In August, a deadly battle in the Sunni enclave of Arsal near the Syrian border ended with jihadists who had streamed into Lebanon from Syria withdrawing after a truce, while taking hostage 30 soldiers and policemen. Three of those soldiers have since been executed, and Syria’s al-Qaeda affiliate al-Nusra Front had threatened to kill a fourth because of the Tripoli violence. Residents of Bab al-Tabbaneh and other parts of Tripoli have long felt they suffer the worst of the country’s political instability. “We always pay the price,” said Khaled Breiss, a father of three who was forced to flee Bab al-Tabbaneh.